International Clinical Trials Day is on Tuesday May 20th but half of all clinical trials have never been published and some have not even been registered. Help the AllTrials.net petition get to 100,000 signatures by International Clinical Trials Day and end the era of secrecy. Hundreds of thousands of people participated in these trials. If action is not taken urgently, information on what was done and what was found in trials could be lost forever, leading to bad treatment decisions, missed opportunities for good medicine and trials being repeated unnecessarily. 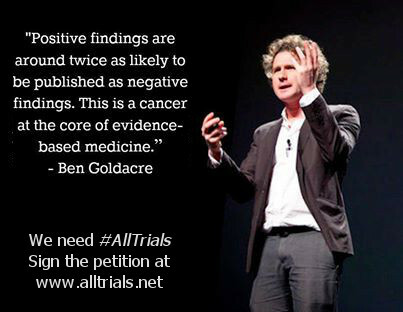 Sign and share the petition at AllTrials.net.